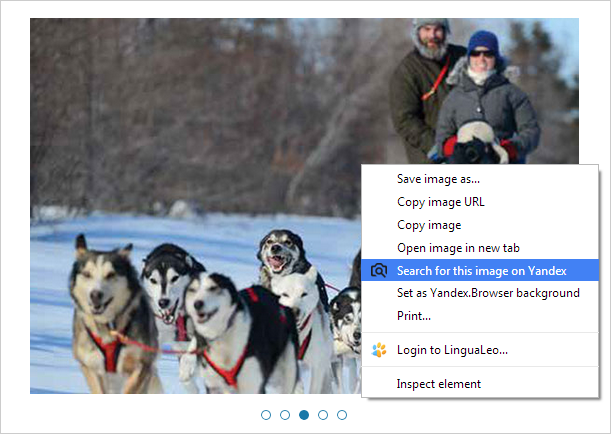 Yandex can search for images based on an example that you input. This can be an entire image or a fragment of it. The example can either be from the internet or stored on your computer or other devices. Image search is based on computer vision algorithms. The search results may contain exact copies of the source image and/or images that differ in minor ways from the original. For example, there may be different photographs of the same monument. Note. Search results are based on similar images found on the internet that have already been indexed by Yandex. That's why there is a greater probability that you will find the same photograph of a specific landmark than that you'll find the same photo from your vacation. Drag a source image into the dialog box. Click Select a file and select an image stored on your hard drive. Enter the image URL in the search field. The image search results are then displayed in groups. You can open a copy of the image in a different size or find out where the image is displayed on other sites. If you are using Yandex.Browser, you can search for an image found on almost any site. Just right-click on the image and select Search for this image on Yandex. Note. Certain website layout issues may limit how Yandex.Images can search for images from that site.